Sometimes you just need to take the time for yourself. And sometimes you need to take the time to go to the dentist. I did both today. With a doctor's appointment, a date with dentist for a crown, and the impending childcare crisis I took the day off work. All those things dealt with (minus an appropriate daycare, still), I did sleep in a little, grab a workout, and finish a quilt. I call this one 'Circle Mama'. It is my plan to use this as a class sample - once I convince a store to let me teach! 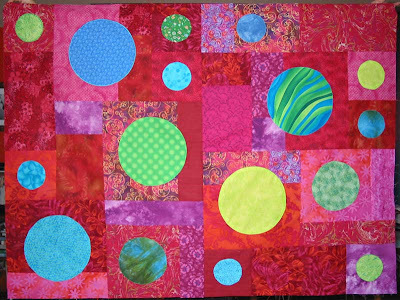 I tried all manners of creating and attaching the circles, including templates, fusing, dryer sheets, aluminum foil and a hot iron, and on and on. There is a clear winner, in my mind. Expect a tutorial soon. Finishing this was a good end to the weekend. Okay, it was a few days after the weekend and I did work those two days, but in my mind this was a mini weekend day. The real weekend was wonderful too. Hubby came home on Friday night from two weeks working up North. That meant I spent some valuable time by myself, sans Monster, on Saturday. After a family trip to the market for groceries I took a long walk in the cold, grabbed a pedicure, and did some junk store shopping. And of course I HAD to let my toes dry for an hour while I chatted and read at the nail shoppe. Sunday we ate blintzes for brunch and walked the dogs. It doesn't get any more domestic than that. Now to end my day on the perfect note I think I will curl up with my book and a cup of hot cocoa with mini marshmallows.